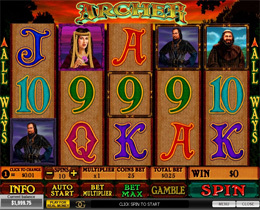 Archer is a 5 reel Playtech video slot consisting of 243 ways to win. It is based on the illusive Robin Hood and his band of merry men who steal from the rich to give to the poor. Archer is full of exciting, action filled features that are guaranteed to keep players entertained. This slot gained popularity after the release of the Hollywood Blockbuster “Robin Hood” played by Russell Crowe. Archer slot contains over 33 winning combinations and icons such as the Arrow, which is the Scatter icon, the Gold Archer which is the Wild. The Jackpot icon, shows up as the Stacked and substitutes all other icons except the Scatter and Bonus icon to complete winning combinations. The Queen, Warriors and the High valued playing cards are the other paying icons. This slot offers players Free Spins Bonus and a Gamble game with an Expand and Split Feature. Archer has high quality graphics and outstanding animations that show up with every winning combination. The coin denomination ranges from 0.01 to 5.00 with the maximum bet per spin being 250. Archer is a great option for gamblers that like to take risks and seek the thrill of wagering high maximum bets.